Back at the end of 2016, Josh Holmes departed Halo maker 343 Industries to pursue his own destiny in game development. Joined by Peter Burzynski and Fredrik Persson, the team formed Midwinter Entertainment in December 2016. "A big reason why we chose to leave and start our own thing was that we wanted to build ambitious games that didn't seem possible within the traditional structure of triple-A," Holmes tells PCGamesInsider.biz. "We wanted to break out on our own and do something that's a little smaller, a little more nimble and get back to the roots of game development where you're a group of people and everyone has a voice in the game that you're building and everyone is jamming on creative ideas and discovering the game as they go versus the more rigorously structured production line that is just a necessity of operating at the scale of hundreds and hundreds of people." Right now the team stands at 17, with the plan being to peak at around 25-to-30 people. Certainly a smaller team than the 350-strong workforce the 343 vets had when working on Halo 5. "There's a lot more flexibility required now which is great because you're constantly wearing multiple hats and learning all different new things that need to get done," Holmes says. "It's exciting. There's a lot of energy and we're having a great time." 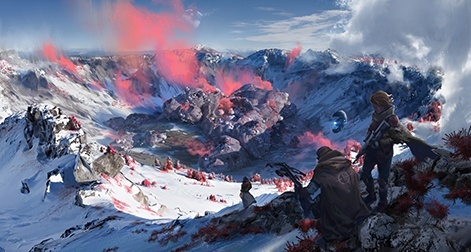 The pitch for Midwinter's first project, Scavengers, will be familiar if you've played Halo 5. That title had one mode called Warzone, which saw 24 players duking it out on a massive map with a whole load of AI opponents thrown into the mix. This combination of PvP and PvE was interesting to Holmes, so they're revisiting it and really honing in on what made that mode tick. 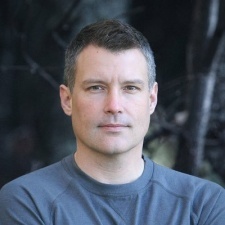 "We want to bring together players in a competitive context," he explains, "But one where that competition endgame isn't necessarily just elimination of other players or killing or where collaboration or co-operation is key and where you're adventuring within this vast, living world where there's many AI that are providing emergent gameplay opportunities, even as players are competing amongst one another as they explore." Midwinter is probably the highest-profile partnership for London-based cloud tech firm Improbable. The start-up has teamed up with other studios before, but with the CVs of Holmes et al, this is a real win for the tech outfit. "One of the big things and challenges is handling the demand of scale and balance that with the really responsive low-latency action-based experience that we're trying to build," Holmes explains. "Again, our experience in the past has been limited to a single server and really requires a lot of compromises. We're constantly balancing the number of players versus the number of AI. And with the AI, you have to determine what the complexity of behaviours that can be represented, how often can you update and so on. It's this really incredible balancing act that goes into that. The great opportunity with SpatialOS is that we can divide the world across many workers and have those workers simulate parts of the world while seamlessly handing off to one another. You can also apply workers to job-specific roles that can enhance the experience. They can do more complex, more dynamic pathfinding, more sophisticated physics calculations. "Once we started learning more about the technology and seeing the opportunity there, it really had a tremendous appeal to us. The other big advantage is that we're pretty early on in the development of the game. We're still discovering what the ideal player count is, what the right density of AI is and in many cases when you're building a game like this, you have to make a lot of those choices really early on and plant those stakes. What SpatialOS allows us to do is discover the game and scale up as we go and we can make choices throughout development where we're not being hindered by the limitations of that single server. Once we're live we'll continue to evolve and expand that experience knowing that we can continue to scale using SpatialOS." Not only is Midwinter arguably the highest profile games studio that Improbable is working with, it's also the first developer to benefit from funding from the cloud start-up. "When we met there was just a great mutual respect from everybody involved in the conversation," Holmes says. "They saw both what we were trying to do and what we had done before. We saw an opportunity to partner with Improbable and help inform some of the work that they're doing to enable the types of experiences that we're building with Scavengers and how that could benefit not just Midwinter and Scavengers but the larger industry as a whole and empower many other developers to go out there and power these types of experiences that wouldn't be possible any other way. That was really enticing and it was finding out through those initial conversations that there was a shared vision there, both from a technical standpoint and an experiential one. The Improbable folks got really excited about what we were trying to build in terms of the game we were talking about. We were very excited about what the technology would enable and what the roadmap would look like for the future. Then we saw this tremendous opportunity to work together and everyone would benefit from that." Scavengers is still a ways off coming out, but Holmes already has some pretty lofty goals for the multiplayer shooter. "Our dream for the game is to bring millions of players together in a shared adventure and have them spend years and years within our world and have that world continue to evolve and expand around them based on the feedback of a vibrant community," he says. "Job no.1 is making sure the game is awesome, make sure people love it. Then we can build from there. But that's what we're all focused on right now."